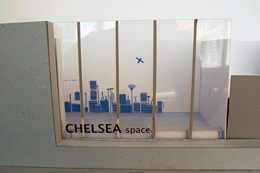 For the past few years CHELSEA space has not only been host to artists and designers it has also become the subject of artworks and research projects. 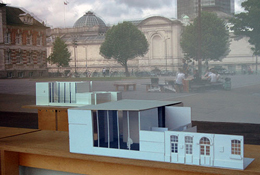 Students on MA Interior & Spatial Design at Chelsea College of Art and Design have used CHELSEA space as a case study considering what the space is used for, how visitors navigate the rooms, and how it is viewed and perceived from the Parade Ground public square outside. 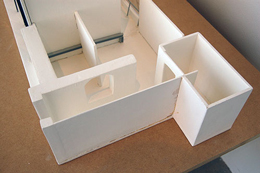 Invariably, the students make architectural models of the space either to imitate the real space in miniature or to illustrate proposed remodelling of the building and potential improvements to the interior layout. For our Summer Window 2013 we are pleased to present the models of 3 MA Interior & Spatial Design students (from left to right): Ami Kanki (2010-11), Laura Blenkinsop (2011-12), and Agnieszka Swietlik (2012-13). Ami Kanki’s model reconstructed the CHELSEA space exhibition of artist Roger Ackling. She then set up small cameras in the model to mimic the conditions of surveillance security. The resulting film had an uncanny quality as it looked like real security footage but, of course, no human presence ever entered the miniaturized space. Laura Blenkinsop researched the original intentions of the architects of CHELSEA space, Allies & Morrison, and compared their vision with the interior alterations that the CHELSEA space Director made to create more walls on which to hang artworks. Blenkinsop’s proposal was to take out the walls again to reveal a liminal space between the exterior frontage and the art school studios behind CHELSEA space. Agnieszka Swietlik had been photographing glass shop fronts on high streets when she realized that CHELSEA space’s large window had similar conditions to retail glass facades. She researched other gallery spaces that incorporated glass and set about remodeling the interior of CHELSEA space to create more flexible spaces and moving walls to create different interior configurations. Her project is ongoing and the final work can be seen at the Chelsea College of Art and Design MA show which runs from 7th – 12th September 2013.